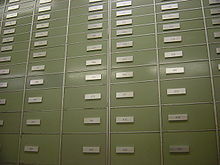 ^ "Valuables & Documents | Safe Deposit Box Insurance Company". safedepositboxinsurance.com. ^ Thinking outside the safe deposit box: Florida Credit Union members use biometric HandReaders. ^ Payne, Kirby D. Safety Deposit Boxes and In-Room Safes.